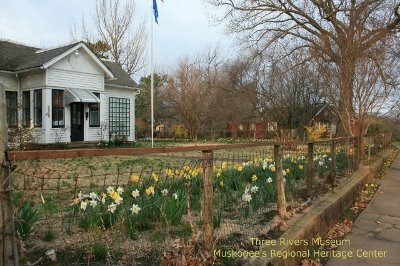 Located on the south east corner of 15th street and West Okmulgee. Admission: $3, under age 6 free. Group rates are available for groups of 10 or more with reservation. Take a brief tour with the video below. In 1897 Judge John Robert Thomas was appointed Federal District Judge At Large to Muskogee Indian Territory by his friend and classmate President William McKinley. Soon after, Judge Thomas, a former Illinois Congressman and his daughter Carolyn moved to Muskogee settling at the Adams House Hotel. Looking for a site on which to build a home, he conferred with his friend Chief Pleasant Porter. The Chief offered to sell him an area 300 feet by 300 feet in the Porter Pasture which extended from Division street (7th street today) to Agency Hill (site of the Jack C. Montgomery VA Medical Center.) 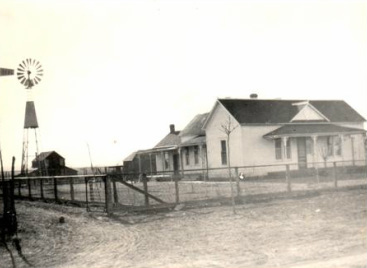 The lot was located on the road to Okmulgee, just over the crest of the hill west of Okmulgee Avenue. 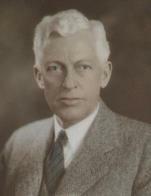 Porter and Clarence Turner had donated an area bounded by Kendall Avenue (12th street) and 14th street, Boston street, and Elgin street to the Presbyterian Church for Henry Kendall College. There were no other buildings in the area with the exception of a small log cabin nearby. There were no trees, just grass. On this property, the Judge built his home, dug a 14 foot deep cistern, and planted 350 fruit and shade trees. Time has taken its toll on the trees of course, however a northern red oak still stands in the northwest corner of the yard. Carolyn picked up several acorns in California and on return from her wedding trip in 1905, planted them, and watched them thrive and grow for more than 60 years. The well and its unique pump still survive.